The SW-1RS Series doubles as a POS Interface Scale and a Portion Control Scale. Great for use in restaurants, ice cream and frozen yougurt shoppes, cafeterias, farmer's markets, and many more. Fits easily on any countertop with its small footprint. NTEP COC 99-002 serial interface is RS-232 9 pin Female. 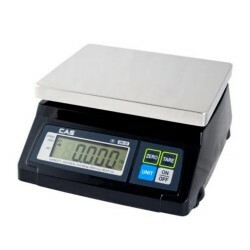 The SW-1RS Series doubles as a POS Interface Scale and a Portion Control Scale. Great for use in restaurants, ice cream and frozen yogurt shoppes, cafeterias, farmer's markets, and many more. Simple and easy to use point of sale digital scale. Fits easily on any countertop with its small footprint. Ideal for use in ice cream & candy shops. NTEP COC # 99-002, keys on front of the scale are Zero, Tare, Unit, Power. The serial interface is RS-232 - 9 pin DB Female. See the CAS Corp SW-1RS POS Scale Brochure (pdf file) for more information.